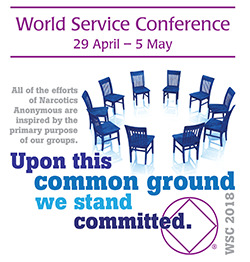 On 17 March 2018, there was a web meeting to orient participants to the World Service Conference. Narcotics Anonymous World Services ("NAWS") provides literature, service materials, bulletins and various other tools for NA members, NA groups, and NA service committees as resources in their NA service delivery efforts. Our production and distribution of these materials is not intended to imply that NAWS is in a position of authority over any of those who use these materials. NAWS does not have any centralized control over any NA members, NA groups, or other NA service committees. All service materials produced by NAWS are offered as a reference resource, and their application is at the sole discretion of the user. They should not be considered directives or mandates from NAWS, and may be adapted or applied as the user sees fit. Additionally, NAWS takes no responsibility in any issues of liability that may result from the application of these materials. Copyright 2019 NA World Services, Inc.